The day before Betty's birthday, I was stuck at home all day on my own, still not able to drive, and I saw the next seven hours stretching out before me. So with one hand in a cast, and a serious case of cabin fever, I decided I could either lurk aimlessly around the internet, go back to bed, or set myself the challenge of making the most elaborate cake I could find. I spent the next six hours solid making Betty a fairy princess cake. Certain aspects of the process proved problematic with one hand, such as kneading and rolling icing, breaking and separating eggs, and whipping egg whites. I ended up with egg dripping down into my cast and a very achy, probably even more broken, wrist. Meanwhile, when we were away in Pembrokeshire a few weeks ago Betty saw this fake Barbie doll in a shop for £1.00 and asked if she could have it. I told her that she could have it for her birthday if she was very good, and then I snuck it into my basket when she wasn't looking. 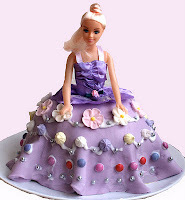 The doll happened to be wearing purple which was perfect for my cake colour scheme, and so, feeling certain that Betty would not even remember the doll she saw in the shop, or indeed recognise it in its new legless form, and with its new cake dress on, I used it for my creation. Tom came home just I had reached the final hurdle - I was having a mini meltdown because I couldn't screw the top of the icing pump on. 'I just want Betty's birthday to be perfect' I wailed. With icing pump catastrophe averted, the cake was finally finished, and with just minutes to spare before Betty would be getting home from school. I could not wait to unleash it on her the next day - a little girl's dream cake. I gave myself a big pat on the back. Betty then walked in from school with the beginnings of chickenpox. She was very poorly the next day (her birthday) but to my delight she asked to see her cake. I ceremoniously brought it in with five candles burning and singing happy birthday, and proudly placed it in front of her. She had a look of utter disbelief on her spotty, calamine-stained little face. There was stunned silence for quite some time before she dutifully blew the candles out and said: 'But Mummy, that's the doll I wanted for my birthday, please take her out of the cake so that I can play with her'. I sloped off back to the kitchen with the cake, painstakingly removed the doll, and ran her under the tap to remove the butter icing, replaced her legs and handed her to a relieved looking Betty. 'Would you like some of your birthday cake?' I asked bravely. 'No thank you Mummy' she said 'maybe when I am better'. I have been eating my way through the cake, pretty much on my own, ever since. I am so sorry that she was ill for her birthday! I am certain that you will make up for it when she is better and she will have an amazing time! Very impressive cake! Happy Birthday Betty! Enjoy all the wonderful times ahead, being 5 yrs old! That's a lovely cake, well done! Aww, I knew how it was going to end! Kids are soooo weird how they just know some things...It's a beautiful cake, you did a fab job, especially as you were working one handed. Hope the chicken pox gets better soon. Still waiting for it to hit here. One confirmed case so far in class and still no sign. Her whole of nursery class last year had it except for her!? Why is this? Anyway, I digress. We all love the cake!! aww. poor little girl, she must feel really rotten. Hope she's on the mend soon. lovely cake, and well done on making it one armed. That's fabulous and even better that you did it with one hand. I'm well impressed! Poor Betty though, I imagine it wasn't the bestest birthday but still sounds like she enjoyed it. I can't believe she's 6. I've known you in the blogging world for a while now and remember when she was a little toddler! Time flies! This just about sums up the highs and lows of parenting doesn't it? Wanting to do your best whatever the hurdles (one-handed), never knowing what's about to hit you (chickenpox) and all to an entirely unpredictable audience! But it's a b brilliant cake and the response from this house was "ow, I wish I could have a birthday cake like that..." - perhaps you should franchise out the idea! You are a star Elsie Button. Oh gosh Elsie, what a time you've been having. Broken wrist, chicken pox. I'm glad your mum was such a help. That cake is a triumph in adversity! Poor Betty - I hope she has recovered by now. Lovely cake - funny that she remembered the doll!